The 4-in-1 AquaMax line of microplate washers are self-contained microplate washer systems. 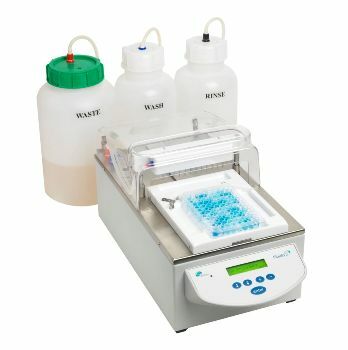 The AquaMax microplate washers are configurable with user interchangeable heads for both 96- and 384-well microplate washing applications, including plate or cell washing. When the AquaMax Microplate Washer is used for biochemical assays such as ELISA, the system is configured with the 96 or 384 plate wash heads to vigorously remove unbound material and reagents in microplate wells. By thoroughly washing plates, researchers can achieve lower background in their assays. For cell-based assays, the AquaMax Washer can be configured with the 96- and 384-well cell wash heads. Cell wash heads have angled dispensing pins to allow extremely gentle washing of weakly adherent cell types, maintaining cell integrity while ensuring thorough washing. AquaMax Washers have several important maintenance features, since the lack of proper washer maintenance is the number one cause of washer failure. Using the One-Touch AutoClean allows the user to completely clean out the entire fluid path. Auto Shutdown leaves the system empty and dry after a user defined interval, preventing the buildup of contaminants.